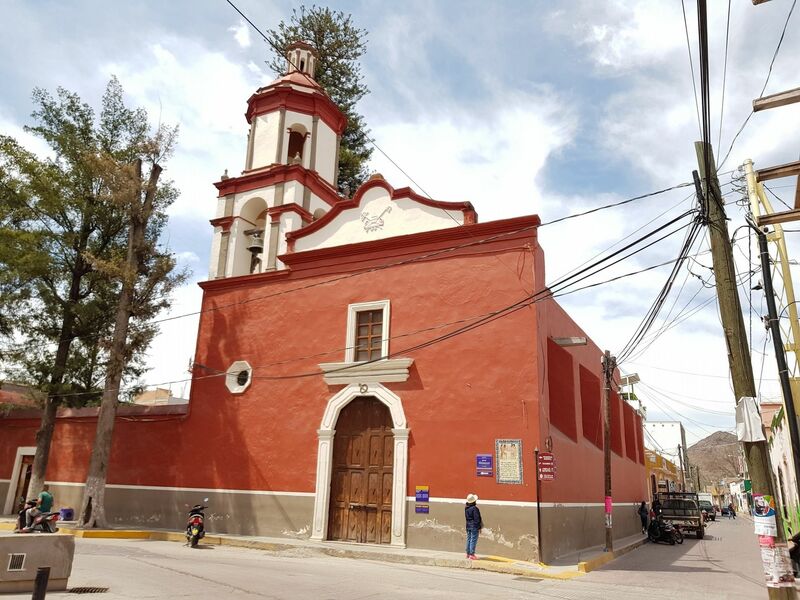 This street that passes here in front of the Royal Treasury (Casas Reales) and the Chapel of Guadalupe was the political dividing line between the "Otomíes", or Upper Town, and the "Guachichiles", or Lower Town. This line was marked with a sword by the Protector of the Indians, Captain Juan Domínguez on May 4, 1610. Location. 21° 48.049′ N, 100° 44.22′ W. Marker is in Santa María del Río, San Luis Potosí, in Municipality of Santa María del Río. Marker is at the intersection of Miguel Hidalgo and Calle Pascual M. Hernández Segura, on the right when traveling south on Miguel Hidalgo. Touch for map. Marker is in this post office area: Santa María del Río, San Luis Potosí 79560, Mexico. Touch for directions. The marker can be seen on the right side of the Chapel of Guadalupe, mentioned in the marker text. The church is commonly known today as the Capilla de Purísima (Chapel of the Most Pure). walking distance of this marker. Purísima Chapel (here, next to this marker); Tourism Office (a few steps from this marker); The Parochial School of Music (a few steps from this marker); Primo Feliciano Velázquez Rodríguez (within shouting distance of this marker); City Hall (within shouting distance of this marker); Foundation of Santa María del Río (within shouting distance of this marker); Hidalgo Garden (within shouting distance of this marker); Dividing Line Between Otomíes and Guachichiles (about 90 meters away, measured in a direct line). Touch for a list and map of all markers in Santa María del Río. Regarding Otomíes and Guachichiles. Otomíes and Guachichiles are two indigenous groups of Mexico. The Otomí (more correctly known as Hñähñu) are considered to have been the original inhabitants of the Mexican central highlands before the arrival of the Aztecs. They lived in areas that now include the states of Hidalgo, Querétaro, the State of Mexico and southern San Luis Potosí. The Guachichiles are generally considered to be part of the larger group known as Chichimecas. These groups generally lived further to the north in harsher desert regions. 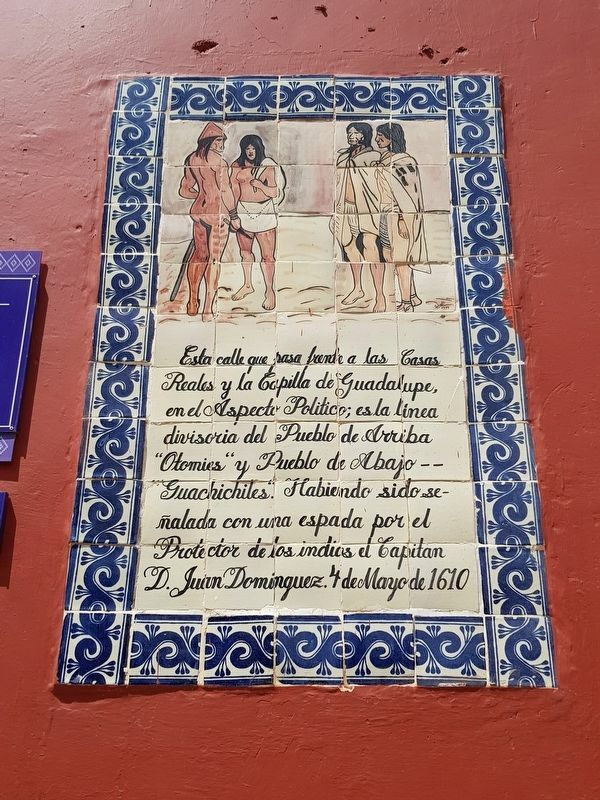 The two groups were probably brought together during the Conquest as Santa María del Río was a "pueblo de indios" (an indigenous town), where Franciscan missionaries attempted to evangelize to the concentrated members of both groups. More. Search the internet for Otomíes and Guachichiles. Credits. This page was last revised on April 14, 2019. This page originally submitted on April 12, 2019, by J. Makali Bruton of Querétaro, Mexico. This page has been viewed 40 times since then. Photos: 1, 2. submitted on April 12, 2019, by J. Makali Bruton of Querétaro, Mexico.